Combining theatre, music, performance and extended radio drama in his work, for many years now, Heiner Goebbels has fused genres and art forms. In this lecture Goebbels will focus on sound. 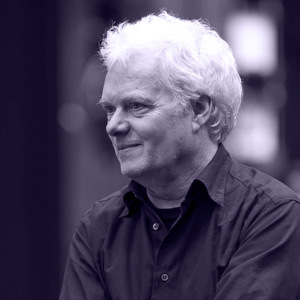 As a musician, composer, Hörspiel-author and director he will use his own works as an example to talk about the significance of the acoustic dimension in performing arts. Heiner Goebbels, musician, composer and theatre practicioner. Compositions for ensemble and large orchestra ("Surrogate Cities", etc. ), radio pieces, often based on texts by Heiner Müller (e.g. "Die Befreiung des Prometheus"), scenic concerts ("Der Mann im Fahrstuhl", "Eislermaterial"), musical theatre ("Schwarz auf Weiß", "Max Black", "Eraritjaritjaka", "Stifters Dinge", etc.). Numerous international CD releases und publications including "Ästhetik der Abwesenheit – Texte zum Theater". Various international prizes for disc records, radio drama, theatre and music, including the International Ibsen Award in 2012. Professor at the Institute of Applied Theatre Science at Justus Liebig University in Giessen and President of the Hessian Theatre Academy. Artistic director of Ruhrtriennale - International Festival of the Arts 2012/2013/2014. Heiner Goebbels lives in Frankfurt am Main.